A Slice of Smith Life: My Blog Has Been Nominated! My Blog Has Been Nominated! 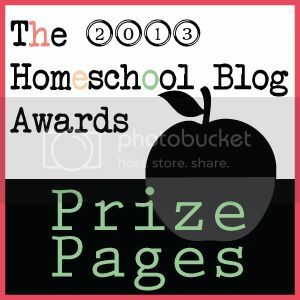 As in years past, I am honored that my little blog in blog land has been nominated for the 2013 Homeschool Blog Awards! I haven't had the time/energy to promote votes for my blog, but I thought a little post about such a recognition was in order. My blog has been nominated in the "Favorite Homeschool Mom Blog" Category and is listed as "Slice of Smith Life." (vs. "A Slice of Smith Life"). 1. If you want to click a vote for my blog in the Favorite Homeschool Mom Blog category, go HERE. 2. Please click to shade the dot to the left of the blog name. Then scroll down the page to click "vote." 3. You can vote in each category, once per day, per device until November 18! What's even more exciting is that there are lots of other Catholic blogs who are in the running for the Homeschool Blog Award prizes. Chris, over at Campfires and Cleats, has put together THIS great list of all the Catholic bloggers who have been nominated and the category they have been nominated in so if you want to support other Catholic bloggers, this is the place to go. Be sure to also click on Chris's blog, Campfires and Cleats, in both the "Best Special Needs Blog" AND the "Best Photos Blog" categories. Remember you can vote daily in each category per device until Nov. 18! Congratulations, Tracy on your nomination! Happy Birthday to Cupcake #4 !